Serve these spiced cod fish cakes with chutney and salad as a light meal or an indulgent starter. Bring a pan of water to the boil and cook the potatoes for approximately 10–12 minutes, or until tender. While the potatoes are cooking, cut the cod loins in half. Put the cod in a steamer or heatproof colander, and sit it on top of the pan of potatoes. Cover with a lid and reduce the heat to a simmer. Steam for 6–8 minutes, or until the fish is cooked through and starting to flake. Remove the fish and set aside. Drain the potatoes and transfer to a large bowl. Add the cod and, using a masher, blend the potatoes and fish together. Stir in the salt, garlic, chillies, coriander and chilli powder. Mix to combine. Add the ground cumin, ginger and beaten egg and mix well to combine. Put the flour in a shallow bowl. Shape large spoonfuls of the fish mixture into rounds using your hands, then flatten slightly before coating well in plain flour. Place on a plate while you use the remaining mixture – it will make approximately 12 fishcakes. Chill the fish cakes in the fridge for 10–15 minutes to firm up. In a non-stick frying pan, heat enough oil to completely cover the base of the pan. Shallow fry the fish cakes for 2–3 minutes on each side until golden brown. Carefully seal the edges of the fish cakes in the oil until golden. 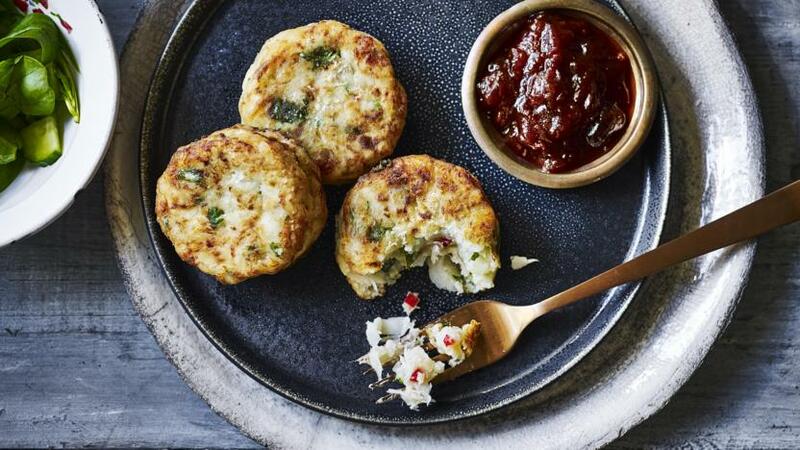 Transfer to a plate and serve the warm fish cakes with sprigs of coriander and tomato chutney. Try eating these fish cakes with a side salad for a more filling meal.